Jan 27, 2015: London, 2000. The move abroad meant being plunked into a vortex of creative and entrepreneurial energy in the digital space. During the first dot-com wave, Europe paved the way for cross-platform (convergent) programming in media and entertainment. Given the European’s habitual use of teletext, the transition to interactive digital platforms was as natural as gulping a pint of ale. At <kpe> Europe, we were not only building Channel 4’s E4 (e4.com) – heralded as Europe’s first broadband channel – but also creating short-form digital entertainment for the new online space. Most viewers didn’t have broadband at the time; Britons accessed E4 via dial-up modems. Drip feed. It didn’t stop E4 from livestreaming “Big Brother” over the Internet. Before anyone knew about the Internet, Europeans were using teletext and interacting daily with their televisions. Few homes in England went without a teletext-enabled TV set. 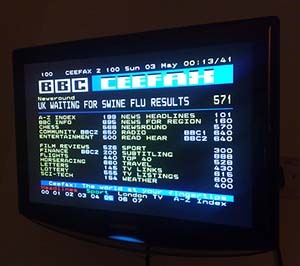 Developed in the 1970s, BBC’s analogue teletext service, Ceefax, allowed users to access news headlines, weather, traffic updates, train and flight schedules, stock prices, TV program schedules, lottery results, sports scores and even recipes. Teletext users leafed through text menus on their TVs as easily as today’s smart phone users thumb through apps. In contrast, the FCC shied away from setting a teletext standard in the 1980s, and left the marketplace to decide on standards. As a result, there was no standard and American TV set manufacturers didn’t bother to include a decoder chip in TV receivers. If you wanted teletext in the US, you had to buy a decoder box. This awkward contraption perched on top of your TV and could dent your wallet by as much as $800 dollars. The way in which Europeans used a remote control to find text information on their TVs was a far cry from Americans who only used a remote control to turn the TV on or off or change the channel. The switch from analogue to digital TV led to the creation of the BBC’s Red Button, which replaced Ceefax. By 2000, viewers could press the red button on their remote controls to access digital teletext. As the Red Button evolved, more interactivity was built into the service. Additional colored buttons were stitched into the Red Button interface, allowing viewers to play games, place bets and shop. The red button logo would also pop up during TV programmes, encouraging the viewer to interact. In 1999, the BBC introduced “on demand” programming with the Wimbledon Championships. For this prototype, viewers could use the Red Button to select the live match they wanted to view. However, TV technology wasn’t yet up to par and couldn’t decode the signal. The BBC had to create its own prototype receiver and then conducted a trial of this new service. Recently, the BBC launched the “Connected Red Button,” which is intended to fuse TV and the Internet. Viewers can use their remote control to flip back and forth between the BBC’s web content and their favourite TV shows. In 2000, Steven Keane, head of commissioning for Channel 4’s new entertainment portal E(entertainment)4 (e4.com), popped over to <kpe>’s office on Great Portland Street. A tall charismatic man, Keane’s chief aspiration was to burn a path from one coast of America to the other, swaddling a motorcycle – a feat he eventually wrapped at a later date. Keane wanted to check on E4’s build as well as talk about commissioning original digital entertainment for the new site. His primary interest was in cross-platform concepts or properties that integrated TV and the Internet. In 2000, Channel 4’s remit was to make everything cross-platform. Strategy pivoted on their targeted demographic – 16-34 year olds and early adopters of digital technology. Keane was keen on E4’s first cross-platform show, Banzai, a zany British spoof of Japanese gameshows. Banzai would be broadcast simultaneously on TV and the Internet. Viewers could bet on a series of challenges via TV or the Web. A WAP game was also developed for Banzai. Tasks ranged from how many helium balloons could make an animal fly to which senior citizen in a wheelchair would chicken out as they raced headlong toward each other. 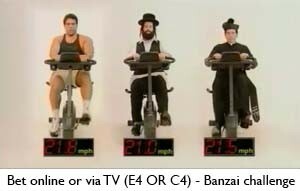 In the “Speed Soul Struggle,” viewers could bet on who would first dip below 20 mph – Lou Ferrigno, a Catholic priest or a Jewish rabbi – on a stationary cycle. This irreverent fare only bolstered Channel 4’s youth branding – one which courted controversy. At this early stage in the Web’s evolution, Channel 4 took the bold leap of designing E4 as a cross-platform vehicle and digital entertainment portal. It wasn’t simply a bolt-on Web site for a traditional broadcaster. E4 commissioned original online games, animations and webisodes. For example, it developed the web series, “Wembley Park,” which featured the characters of David Beckham and Posh Spice. While E4 used US programming, such as “Friends,” to drive audiences to the Web site, the portal was designed to be an incubator for new British talent and TV shows. The timing of the 2000 launch of Channel 4’s E4 and Endemol’s “Big Brother” reality TV show was the double whammy that galvanized viewers to go cross-platform. While people could watch Big Brother UK as a one-hour documentary on Channel 4, they could also transit to E4 and access a livestream of house guest antics on the Internet. In 2000, the combination of an innovative TV format – “Big Brother” – with a pioneering digital entertainment platform – Channel 4’s E4 – rocketshipped cross-platform programming to a new level. As a high concept show, this type of event TV was especially designed to reach a critical mass of viewers via multiple platforms – TV, Web, mobile devices, radio, tabloid newspapers and books. Big Brother’s success was, in fact, dependent on interactivity. Viewers voted daily to keep their favourite house guests on the show or boot them out. They had access to chat rooms, bulletin boards, online quizzes and opinion polls. According to Anita Biressi and Heather Nunn’s book “Reality TV: Realism and Revelation,” more than 40 versions of the Big Brother format have been commissioned worldwide. A user’s ability to vote for or against a house guest on “Big Brother” depended on the availability of mobile applications. In this arena, Europe streaked ahead of the U.S. Because the International Telecommunication Union (ITU) had created a single standard for the third generation (3G) system for mobile communications – known as IMT-2000 – developers could produce multimedia services for mobile phones with ease. While Europeans were dreaming up and implementing a wide variety of mobile games and applications, mobile companies were still hotly debating whether or not to institute a mandated standard in the U.S. Ericsson and Motorola lobbied for a single standard but Lucent and other companies stuck to the U.S. paradigm of competition. Lucent won the argument and, as a result, multiple standards sprang forth in the mobile market, prompting a standards war. This predicament only retarded the development of mobile applications in America.